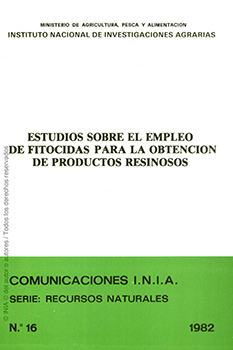 Top » Catalog » Forestry » Studies on the use of phytocides to obtain resinous products. I part. Studies on the use of phytocides to obtain resinous products. I part. The final purpose of this work is to investigate the possibility to diversify the obtainment of sources of resinous products in our country through solutions compatible and complementary with lumbering and pulping. The first results obtained are described. The research was carried out on the most representative resinous species, Pinus pinaster Ait., Mediterranean and Atlantic subspecies, in related significative areas with assay of the various techniques described and the use of paraquat and diquat phytocides. The formation of resinous products in the trees treated with both pytocides is deduced from a statistical study of the obtained data. The increase of extract´s contents is not affected significantly by the application method but by the dose employed, together with other peculiarities stated in the conclusions. Physical Description : 31 p; 17x24; il.